Employees love to feel appreciated – so why aren’t we doing it enough? Recognition is not happening as often as it should be, nor is it as well executed as it should be. O.C. Tanner’s year-long, international study, called 2018 Global Culture Report found only 61% of employees feel appreciated in the workplace, and when recognition is given, it is done incorrectly 1/3rd of the time. 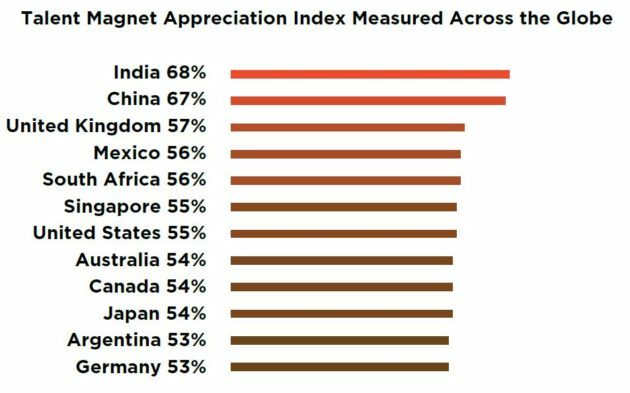 As part of the research, 14,000 respondents were surveyed across 12 countries, including India, China, Singapore, Australia, and Japan – to uncover six fundamental elements that are crucial to an employee’s decision to join, engage with, and remain at an organisation, called ‘Talent Magnets’. Appreciation is more than a mere ‘thank you’; per the report, five dimensions of appreciation were stated: frequency of recognition received; the sincerity and meaningfulness of the recognition; consistency of recognition for high performers; leader acknowledgment; and making it a habit. Rather than an afterthought, recognition must be deliberate and on time when employees display extra effort, accomplish something great, or achieve a career milestone. A good rule of thumb: recognise first. More employees will see and hear the recognition moment if it takes place at the beginning of a meeting, rather than at the end. The same is true of a newsletter; the portion on recognition will be read more if it is placed on the front page in a prominent spot. Or schedule an entire meeting or quick check-in where the only agenda item is giving recognition. When recognition is not seen as a priority for their organisation, employees are: 38% less likely to feel appreciated, 22% less likely to give others recognition, 68% more likely to feel like the recognition they receive is an empty gesture, and 40% more likely to feel that they rarely receive recognition from peers. When leaders give generic thanks or appreciation to a group, rather than an individual, it can dilute the experience. In fact, two in five (40%) of employees feel that the recognition they receive at work feels like an empty gesture. Instead, leaders should be specific about who, what, and why they are appreciating. Establish champions who can train and teach recognition best practices to leaders and new employees. Create a feedback mechanism so leaders can know and stay up to date on the great work their people are doing. Recognition should be a part of your company’s culture, not just an HR programme. To make employees feel irreplaceable, develop them into subject matter experts. Connect them with others in the organisation so that people come to them for help and guidance. This helps to highlight an employee’s specific strengths and connect those strengths to specific accomplishments. By establishing people as experts, you inspire them to lead on their own. When people at an employee’s organisation come to him or her for help, we see a: 40% increase in appreciation, 59% increase in engagement, and 30% increase in job satisfaction.